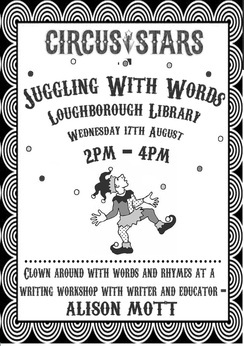 The children’s workshop I ran as part of Loughborough Library’s Circus Stars Summer Reading Challenge was fun, and with a steady flow of customers of a diverse spread of tastes and ages, I was glad I had activities to suit everyone. Some children wrote, many children coloured and everyone chatted. What a great way to spend an afternoon!